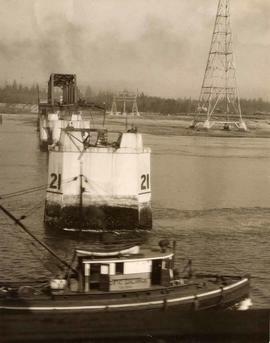 Photograph depicts boats docked at Coal Harbour.Two large ships and smaller vessels dock at marina; Vancouver Rowing Club and Stanley Park Seawall behind marina; North Shore mountains in background. 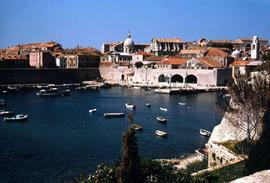 Colour Kodachrome 35mm slide depicts boats docked in an urban setting. Colour Kodachrome 35mm slide depicts a body of water and several boats with buildings in the background and a construction site in the foreground. Colour Kodachrome 35mm slide depicts a body of water with a red and white boat and a house or cabin on a rocky, tree lined shore in the right side of the image. There are mountains in the background.